Michael Moberg comes from the military, where he has served during 8 years as a naval officer, after also studying political science in Turku. He is also a family man, married with 3 children, and his family is the most important part of his life . He is an idealist who wants to make Finland and the world better, and he is enthusiast. And a social democrat who wants Finland to join NATO, as he explains in the interview. He has also published with James Mashiri and Charly Salonius-Pasternak an article in Suomen Kuvalehti describing three plausible scenarios of intervention of Russia in the Baltic sea. All this makes him of the most interesting social democrats in this election, and we could not miss the opportunity to have a thorough interview with him. How did you come into politics in the Social Democratic Party? After the military I worked for 2 years as a management consultant for a company called Mercuri-Urval. When I was working there, I developed a close relationship with different clients, and one of them recruited me in 2012. 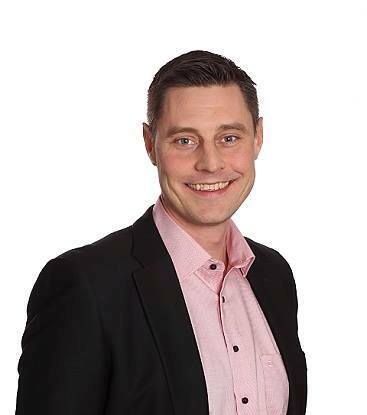 I became the country manager for Carefusion Finland, and that is where I am working now. My political background is quite new, of course, because in Finland if you are in the military it is not legal to be a member of a political party or take part in any kind of political activity, which is evidently good, as proven by example in history or even in other countries today. I had political contacts then, as I have always been interested, but I became active only when I left the military. I always get the question of my choice of the social democratic party (SDP), as my family background was very “bourgeois”, and as the military is generally considered more on the right than on the left side. I think it has to do quite much with what happened to me in Afghanistan, when I saw how a society can fail, when I saw utter misery day in day out, when I saw the reasons why that happens regarding inequalities, social inequalities, inequalities between the genders and so forth, that kind of woke me up. I have always said that my most important value is justice, and I feel that the SDP is a movement that it for justice for all, and that is why I am with them, even though my background is what it is. How did you get the idea of becoming a politician? We have no military personnel and no politicians in the family, so I am a kind of black sheep in both senses. I think it kind of has to do with a calling, as you have a calling when you become a civil servant, you want to do something bigger than just playing around with money, trying to make as much money as possible. So I think that life is richer that way and you get more from life itself, if you can make a few good things. It is a very idealistic reason, I feel. What are the main topics of your campaign? I mainly speak about of course the economy, which every candidate must talk about, but it is very interesting for me. Then of course security policy, energy policy and families. We have three kids of our own, so it is very natural to talk about families with young children. So these are the four main themes. About the economic situation of Finland, what would you push for? I am very disappointed that these big structural reforms have not succeeded, I see in a way that we can do such changes, such as the social and health reform, the municipal reform, because we have way too much municipalities from my point of view. Instead of Finland going in a situation where we would have to cut benefits and services, which may seem as an easy way to save money, we should try to look for big changes, structural changes, in order to save money and be more efficient. And I feel that we have a lot to do in that respect, if we find a consensus and a political will. We may also consider that certain ministries should cut certain things, but as a social democrat I would have a very hard time accepting cuts hurting the weakest people in the society. Rinne is actually coming out with a list in the next weeks, I think, because the party is cut, so to speak. I am not very sure it is a good thing to go in the details and to speak about 2 billion, 3 billion, or 2.3 billion, as it never goes along the initial plan. If you look into the future and we have an ageing population, we need to do these structural changes anyway. And I am not very keen on cutting on education that is one of the best investment you can make for the future, so you have to be very careful about that. Anyway, everybody hates cuts, I hate cuts. That is why I would prefer to explain how we can do things smarter. I worked with hospitals, and in a hospital there are all kind of things we can do differently here and there and make it very much more cost effective. We know that, people working there know that, but it takes a lot of time to change an organisation of that size, so I am not that pessimistic either. However, our national debt is close to 60 % of the GDP, we need to act and reform, we cannot simply wait for growth. Everybody is talking about growth, but we have waited for it for 7 years. And if we see the growth coming, the government has to support it, and not kill it by not reforming. I also feel that we have to keep the salaries increases at a very modest level. Of course, if suddenly the economy improves, which I do not think is realistic, we could slowly be more flexible and adjust salaries and pensions according to that, if the export side is in good shape. But it would not be responsible to think about it now. And even if this case, it would be irresponsible to keep the present number of responsibilities without doing anything to make the system more efficient. People do not really care if the public provider is Kirkkonummi or Espoo or Helsinki, as long as you get the service. However, if we do large cuts or large reforms, we need to be absolutely sure that they will function, and we need to be absolutely sure that there is justice in these changes, we cannot cut for people who have almost nothing. About the hospital systems, studies do not show that the biggest hospitals are the most efficient. Small hospitals are not, but big hospitals are not either. The optimal size is relatively average, so is it worth regrouping municipalities for reasons of efficiency in the health system? For the structural health reform, the problem is mainly about primary care, not so much about Helsinki University Hospital or Turku University hospital. But there is this other aspect of working smarter: I worked with these people in Helsinki University Hospital, and from the care point of view it works very well. But if you ask them from a management point of view if you ask them how many people have you taken care of today in this building, or how many IT programmes they use, they have difficulties to answer. And then you discover that they may have different IT systems doing basically the same thing, and the systems don’t talk to each other, which leads to a discussion about simplifying and harmonising all systems. Concerning the municipalities, the idea is not to force them to accept mergers, it would be to make them understand from a national perspective that we should have more and more synergies, for example in the IT side, because that situation is absolutely terrible. Living in 2015 and having a lot of these problems, with methods and tools developed separately, is not acceptable. Cutting is not the solution, looking for synergies and smart moves is. We will see who is right, but I would not go straight ahead with heavy cuts, but be moderate in the cuts and look for efficiency gains. One of your main campaign theme is defence. Is there something wrong about the Finnish defence policy? You can say that. There was this study done last year, from the Officers’ union, Upseeriliitto, showing that a little bit under 80 % of officers do not see our defence capacity as being credible. I have to agree with it. We have never in history made it alone, and our forces are never going to be in that level that we would be able to build a global system to that effect. And that’s why a natural way of going with it is NATO, and I am for NATO membership. Is it an original position in the Social Democratic Party? That is true, I think that I was the only one in the SDP having this position, when we had this question on YLE , so I have to discuss that almost every time in the media, and with my own party members as well. Actually I use a very nice argument: Jens Stoltenberg, who is NATO General Secretary, used to be an important member of the Norwegian Labour Party, the equivalent of the SDP, and also Workers’ Youth League’s leader. And the French or Danish social democrats are in favour of NATO membership, they never consider leaving it when they are in power. So I do not consider it as ideological debate, instead I try to have a very pragmatic approach of the question. Why about the possible reaction from Russia? Let us be practical. In 2020s, Finland will have to renew all the Hornets, we will have to renew the Hamina class missile boats, and just these two represent approximately 10 billion euros. Even though we can do that, we still will not have the capability of defending ourselves. We could of course go along with it and not increase our capacity of defending ourselves: in Sweden, they say they can defend themselves for a week; maybe our time is longer. And I don’t see why we should take a decision based on fear: it is like for a house wanting to get an insurance once the fire has started, it is not possible, you have to do it in advance. And this kind of planning is a not a short-term process, you cannot get in very fast. Is this a common view in the Finnish army? Yes, and the interesting thing if you look at the Upseeriliitto questionnaire is that the higher you go in the rank, the higher proportion of positive answers. The colonels and the generals are much more for NATO than many of the lower ranks. That also tells you about the story, because they see the whole picture. What is the best time to decide, when some people are speaking about a referendum? As you know, NATO does not take member countries where the majority of the population is not for membership. So of course it is not possible now to join, from my perspective. I don’t think that we should ever make that decision against the will of the majority, it would be wrong. But that said I find it very important to have a very honest discussion, not about NATO only. We can certainly have a discussion about NATO also, but the most important discussion which has not happened is about our current status, what is the credibility of the Finnish defence. The Swedes do that on a regular basis, in Finland almost never. So people can have an unrealistic view of our capability, and that´s what I am afraid about, the discussion now is not based on facts, it is based on strong subjective opinions, or fear, on ideological reasons, but not on facts. And that is what I want first, and we can look if NATO is the best solution. I think it is, but we need to discuss. From what you say, you do not consider a defence agreement with Sweden very useful? The second thing: why should we develop something next to NATO, without working with them, when Russia considers us as a part of the western world anyway, Sweden even more? Russia would not see a very big difference if we are together. What do you think of the ongoing discussions on the European defence, because in particular NATO troops in Europe are mainly European? If you take the population of the EU, we have 95 % of the population living in a NATO country approximately, and 22 of the 28 EU members are NATO countries, so I don’t see them agreeing on a second defence system called an EU army or whatever. Even if you would, the European countries would still be very dependent on strategic access to capabilities of the US. I would understand the idea if you wanted to cut the dependency from the US, and limit the US influence in Europe. I cannot say that it is impossible, but I do not see it as a logical step. When you will be in the Parliament, what would be the first law that you would like to see adopted? It will I would like to have a law which ensures that every child and adolescent has the necessary support to practice the hobby or the sport that they want. I find it worrisome that expenses regarding football, ice hockey, and many different sports have been doubled or tripled in the last years, and I would like to see a law on my desk that would somehow minimise the expenses for the family. I see it myself, my son practices ice hockey, and some children had to quit because parents had not the money for it. And there is an interesting report from the Education and Culture Ministry published a year ago which compared the costs between 2001 and 2012 and has shown how much they have increased. And there is a public health perspective, as it is a big asset when you are able to have a hobby as a child. I can’t even imagine what it does to a child which is very into football, and one day that child’s mother or father comes and says “look, you cannot play because we cannot afford the expenses”, and it is football, it should not be that expensive! I am not sure about the details, but I would like to really change that. There are ongoing discussions because the employers’ think-tank EVA indicated that the Finnish economy needs more immigrants in the workforce. What do you think of it? I am very positive for work immigration. I see its positive effects on a number of countries such as Sweden, and I would encourage Finland to act on that quite fast, as it seems that we would need around 200 000 people. There are almost the same amount of unemployed people in Finland. Is it logical to get more immigrants, when in addition in certain groups of immigrants the unemployment rate is almost 50%? That is true, and it is a very common discussion in every coffee place. It is a very serious issue, because one cannot blame refugees for this situation that would be wrong. We should instead look at the system: are we able to integrate people in this country? I believe that is true, we should be able to do it. But the question is how you socially integrate people in the society, when they do not feel welcome at all. Finland is still quite rural in that sense, and conservative, except for the new generation. This has to change, otherwise we just have the problems and we do not benefit from what immigration could bring. In addition, even if it not always popular among social democrats, I would like to see changes in the way we encourage people to take a job. I do not mean that they should have to drive 100 kilometres a day, or accept terrible wages, but there needs to be a middle ground there, because I don’t think the majority of unemployed people want to stay unemployed. But the system is not working, so we need to encourage companies to hire more, and to encourage people to accept jobs, with the idea that in most of the case a job is better than no jobs, as long as there are frames prohibiting slave jobs, or too low wages, or unfair treatment. But there are jobs out there! Some experts and political parties would propose to lower the unemployment benefits faster in order to push people to go back to work as soon as possible. What would you think about it. I kind of disagree with them, because if suddenly you are kicked out of your job, which unfortunately happens very often nowadays, you need to have time to look for a job, and some kind of financial security because it is not easy to limit suddenly your family expenses, you have a house, a family, it depends also if you spouse is working or not working, there are a lot of arrangements to do before you can start lowering significantly your expenses, and that is why you need a safety net. In Finland, you get this money for 500 days, which seems like a long time, but practically it allows you to adapt and look actively for a job, which in a number of case may be not so well paid. How is it to be campaigning? Heavy! I have a day job and we have 3 kids, so most of the campaign is done during the week-end, so campaigning on the side of your normal life is almost like having another job! It is not very fair because the Members of the present Parliament get a full salary this month, and can campaign full time. At the same time, it is an extraordinary possibility to meet people, which is fun when you discuss with them and get to debate about Finland and its future! It is a learning experience, I would just like to have 30 hours a day!